Simple design makes it easy for beginners to use. Aperture (mm): 76 mm (2.99 in). QUICK LINKS. - Inspire our people and partners to unite behind our purpose. - Fight to change policy, practice and public opinion. New it costs £65 . The smooth functioning mount and erect diagonal imaging help with orientation and make pointing at objects seamless. Lens Coating Fully coated. Features Mounted, Quick Release, Lens Cover, Water-Resistant, Dew Shield, Nitrogen-Filled. NexStar Database 4,000 Object Database. Slew Speeds Nine slew speeds. Optical Coatings Aluminum. Secondary Mirror Obstruction by Area 13%. Secondary Mirror Obstruction 41mm (1.6"). Linear Field of View (@1000 yds) 59 ft (18 m). The design is compact and and portable whilst maintaining great optical performance. The Travel Scope is made of the highest quality materials to ensure stability and durability. Spend a night camping under the stars with your Travel Scope. 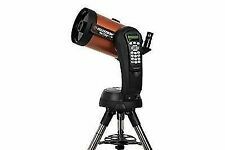 Celestron Astromaster LT 76 AZ Stargazing Astronomy Telescope #31036 (UK Stock) . Condition is Used. Dispatched with Royal Mail 2nd Class. Erect image diagonal so that your views are correctly oriented. Smooth functioning altazimuth mount with easy pointing to locate objects. Preassembled aluminum full size photographic tripod ensures a stable platform. Orange Filter no.21. Green Filter no.56. Crystalview Moon Filter. Astronomy Binoculars. - Simple design makes it easy for beginners to use. Aperture (mm): 76 mm (2.99 in). We endeavour to dispatch all orders within 24 hours excluding weekends. Professional Tripods. The NexStar 90 SLT is good for terrestrial and celestial observing and includes the CD-ROM, The SkyX First Light Edition astronomy software which provides education about the sky and printable sky map. Celestron Astro Fi 102mm Maksutov-Cassegrain Astronomy Telescope. Condition is fantastic. Apart from a tear on the outer box, its pretty much perfect. Iv just taken it out of the box for a photo. The tripod is obviously much bigger when extended. Connects to free app, so you just choose the stars you want to look at and push the button on your phone. The telescope does the rest. Comes with all original accessories/eye pieces. Any inspection welcome 100% Feedback. Buy with confidence. Fast shipping. Just hold your smart device up to the night sky. When you find an object you�d like to view, tap the screen. Astronomy Binoculars. Helpful Links. We endeavour to dispatch all orders within 24 hours excluding weekends. With a total weight of 21 lbs including the tripod, the ultra portable 4 SE features a precision optical system with 1,325 mm focal length (f/13) and is the first Maksutov system to ever feature our premium Star Bright XLT coatings. It features two high-quality Kellner eyepieces are included to enhance your views. The steel tripod provides stability. Its wide field of view renders the Moon, the Milky Way galaxy, and the rings of Saturn in impressive detail. Condition is (hardly) Used! 10mm and 20mm eyepiece. 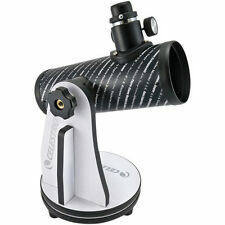 Celestron Omni XLT AZ 102 Specifications: Optical Design: Refractor. The 102 mm refractor provides enough light-gathering ability to view all the best celestial objects in the solar system and beyond. Using the NexStar 6 SE is quick and easy. Every NexStar SE includes a version of The Sky software Level 1 Planetarium software for exploring the Universe on your PC and printing out custom star charts of the sky. As you can see from the pictures that have been provided the exterior condition is excellent with very little signs of use. One sign of use that can be seen is at the top of the tripod this is clearly shown in picture 2. With its pre-assembled, adjustable steel tripod, the NexStar 130 SLT can be up and ready to use in a matter of minutes. The Celestron NexStar 130 SLT has the Newtonian design, and the mirror gives fully color-corrected views that are best suited for astronomical use. Condition is New. Celestron is changing the way we experience astronomy, but changing the way you interact with the night sky. Includes a StarPointer finderscope, 2 Kellner eyepieces, and mirror star diagonal. The NexStar 8 SE features Schmidt-Cassegrain 8" aperture optics with our premium StarBright XLT coatings, powerful 2,032mm focal length and an f/10 focal ratio. Every NexStar SE includes a version of The Sky software Level 1 Planetarium software for exploring the Universe on your PC and printing out custom star charts of the sky. Explore our Solar System, from the moons of Jupiter to the rings of Saturn and beyond. Then venture further into deep space to view the Orion Nebula, Pleiades Star Cluster, and hundreds of other objects. The lens cap has an integrated smartphone adapter built into it. Secure the smartphone using the two adjustable bungee cords. The inside of the lens cap has a fitting that secures to your eyepiece using two set screws. All glass, fully coated optics reveal the depths of our solar system and the wonders of the Universe. - Lightweight Computerised Mount. Includes CD-ROM "The Sky" Astronomy Software. Astronomy Binoculars. Astronomy Binoculars. Optical Design: Refractor. - Erect image optics. - All coated glass optics. MPN : 21063-CGL. We endeavour to dispatch all orders within 24 hours excluding weekends. Weight: 9.07 kg (20 lb). TRIPOD AND MOUNT WEIGHT: 9 lb (4.08 kg). STAR DIAGONAL: 1.25". OPTICAL TUBE LENGTH: 16 in (406.4 mm). SECONDARY MIRROR OBSTRUCTION BY AREA: 14 %. SECONDARY MIRROR OBSTRUCTION: 2.2 in (55.88 mm). OPTICAL COATINGS: StarBright XLT Coatings. For over 50 years, they’ve led the industry in optical technology—and they’ve put that experience into the Astro Fi 130. The Astro Fi 130 creates its own wireless connection, so it can communicate with your device even in remote locations where WiFi or cellular networks aren’t available. This 70mm model is the lightest & most portable of the Inspire range for easy transport. 70mm Refractor OTA. Smartphone Digiscoping Adapter. Steel tripod for sturdy support. Accessories included: StarPointer Pro finderscope, 2 Kellner eyepieces, mount with tripod and folding accessory tray connected, red LED flashlight, 90 degree erect image diagonal. With its pre-assembled, adjustable steel tripod, the NexStar 130 SLT can be up and ready to use in a matter of minutes. Because of the Newtonian Design, the mirror gives fully colour-corrected views that are best suited for astronomical use. The PowerSeeker is quick and easy to set up. Highest Useful Magnification 189x. Tripod Heads & Accessories. - Aluminium tripod. Tripod Aluminum. Optical Design Refractor. InkJet Printer Paper. They are designed and manufactured using all fully coated glass optical components with high transmission coatings for enhanced image brightness and clarity. Download Celestron’s Starry Night Software and learn about the night sky, celestial objects, and how to plan your next observing session. Smartphone Adapter – Image celestial or terrestrial objects with this smartphone adapter! Item model number: 22054. Each step, helpful hints, and valuable reference materials are easily accessible to ensure a simple and pleasurable viewing experience. Experienced observers will appreciate the comprehensive database of 4000 objects, along with the customised lists of the most intriguing deep-sky objects, planets, and double stars. Astronomy Binoculars. Optical Design: Newtonian Reflector. MPN : 31036-CGL. Remote & Cable Releases. Cokin Filter System. USB Flash Drive. We endeavour to dispatch all orders within 24 hours excluding weekends. NEXSTAR handset. CD ROM : The Sky Level 1 and NexStar Observers List (v2.6.4c). APERTURE : 90 mm (3.54 in). LINEAR FIELD OF VIEW (@1000 yds) : 53 ft (16.15 m). WEIGHT : 12 lb (5.44 kg). EYEPIECE 1 : 25 mm (0.98 in). The StarPointer finderscope is factory attached to the optical tube. It has an illuminated reticle to help zero in on the general field of view containing the targeted sky object. The StarPointer's battery is included. The PowerSeeker is quick and easy to set up. Astronomy Binoculars. Optical Design Refractor. - Erect image optics - Ideal for terrestrial and astronomical use. We endeavour to dispatch all orders within 24 hours excluding weekends. It has an iInternal flip mirror for viewing straight through (with optional diagonal) or at 90 degrees. There is a quick release fork arm mount, optical tube and accessory tray for no-tool setup and a sturdy computerized Altazimuth mount. The popularity of previous short tube Celestron NexStar refractor models inspired to go a step further with the introduction of our NexStar 102 SLT. With its pre-assembled, adjustable steel tripod, the NexStar 102 SLT can be up and ready to use in a matter of minutes. It really is a joy to use and is very user friendly. allowing you to slew to all the best celestial objects with a tap of your smartphone or tablet. Celestron NexStar Evolution 9.25 Specifications. The Celestron Sky Portal App is based on the Excellent Sky Safari and has an excellent and intuitive 'tap and go' user interface. Setting up your NexStar Evolution is quick and painless with large, ergonomic handles. As you progress in the hobby of astroimaging, you can add our HD Pro Wedge to achieve longer exposures for more detailed astrophotos. Computerised Maksutov Cassegrain lens. Fully coated glass optics provide outstandingly clear views of the planets and deep space objects. Aperture: 102mm. Magnification: 132x. Aluminium tripod for sturdy support. It features fully-coated glass optics to provide outstanding views of the moon and planets, and includes a StarPointer finderscope, 2 Kellner eyepieces, and a mirror star diagonal. For over 50 years, Celestron have led the industry in optical technology—and they have put that experience into the Astro Fi 102. Optical Design Schmidt Cassegrain. Setting up your NexStar Evolution is quick and painless with large, ergonomic handles. As you progress in the hobby of astroimaging, you can add our HD Pro Wedge to achieve longer exposures for more detailed astrophotos. Celestron 22203 AstroFi 130 Wireless Reflecting Telescope - Black . Celestron 21039 PowerSeeker 50AZ Refractor Telescope . 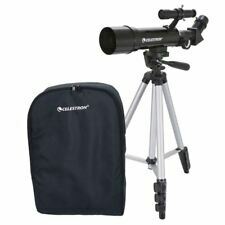 Celestron 21035-ADS Travelscope 70 Telescope Kit .